Yeah for spring break! 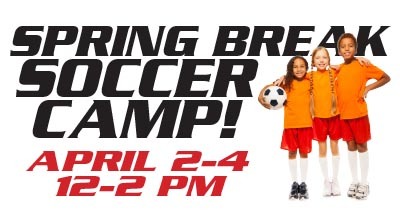 “Wait a minute, what are we going to do with the kids all week?” The Sports Academy and the Michigan Burn Soccer Club will be hosting a Spring Break Soccer Camp April 2-4 and would like to invite all boys and girls ages 6-13 to participate. It is a great opportunity for players to work with Burn coaches in a fun and positive environment while igniting their passion for soccer. Michigan Burn Soccer Club is an elite soccer program providing soccer education for beginner level to future college players. We look at the player as a whole, incorporating both physical skills and the life skills necessary to find the champion within.